This issue’s article is by Prof. Brian G. Mc Enery the founder of Dámhsgoil Namhachais na hErend: ie.linkedin.com/in/briangmcenery. This is a multi-lingual multi-topical academy of knowledge. Please see the following important item from our Webmaster regarding future developments. 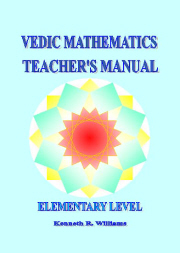 The contents of the web site are free to all who wish to learn Vedic Mathematics and we would also like to make a much larger range of material freely available. However the cost of developing and maintaining this web site is not free. So unless we get funding for full time development of the tutorial material and other web site costs e.g. hosting, domain renewals, licenses, development computers etc., we expect the addition of new tutorial material to remain slow. In the Vedic tradition education was freely given with the student paying a donation of some form within their means after being taught. In recognition of this tradition we will be making all of the current tutorials and a video course by Kenneth Williams available for free on the website (we will make a decision on whether this stays this way in the future). With the advent of crowd funding over the internet, it is possible to have a large number of people pay for the development and maintenance costs, enabling the content to be available for all whether they can afford to pay or not. N.B. if you prefer not to sponsor us on a regular basis, one off donations will still be gratefully received. In the past we have received donations for supporting the work of developing the website and we are very grateful to those people. ‘Understanding Mathematical Basis of English language’ begins on 15th March 2014. Dr Kapoor says: It is going to be in the form of understanding steps. Here I shall be chasing mathematical basis of orthodox English vocabulary with the help of illustrative cases. I plan to take up 360 illustrations. One illustration is to be taken up a day. This, this way shall be taking me a year to demonstrate the features of mathematical base of English. ‘Vedic Mathematics Science and Technology (Foundation course)’ begins on 1st April 2014. A skills based approach to basic arithmetic provides a pathway to developing holistic thinking which may be inculcated in young students from a very young age. It complements the rational methods dominated by logic and provides a means of developing neural heuristics to enhance the processing power of the mind/brain physiology. We are normally lead to believe that mathematical knowledge is based on truth or falsity, that the answer to a question is either right or wrong. But mathematics is an abstraction of processes which occur in nature, and whereas pure mathematics may be guided by George Boole's book An Investigation Laws of Thought, the actual processes of nature are guided by much deeper principles than simple 0's and 1's. Fine, the principles of Boolean logic have given rise to many great developments within the field of information and communications technology, but they have also constrained the operation of our minds, particularly when far too much emphasis is placed on discrete logic in relation to thought, rather than a more holistic approach. So how do we break out of these constraints, both as adults, and most importantly how do we ensure that our educational system promotes a more balanced all inclusive system of both thinking about and teaching basic numerical processing. It is an indictment of our formal educational system globally that many people who leave school after fifteen to twenty years of education are functionally innumerate. The loss is not only in terms of numerical processing itself, but in the failure of our educational system to properly develop the enormous processing power inherent in the mind. Developing this processing power is of immense importance today, as we are bombarded with an increasing amount of information, which we must have the skill to rapidly interpret and make decisions about. Rather than berate the current educational model further, I will instead propose a model of numerical education which includes not only logical approaches to mathematics but also includes computational knowledge from other sources which I collectively call natural computation. My first introduction to this came in 1994 when on an advanced meditation course in the U.K. At the time I had begun studying the vedic knowledge from India, having learned the Transcendental Meditation technique some years before. Whilst in the U.K. I picked up two little books, then being popularised in schools in India. They concerned a system of computation known as vedic mathematics which were based on the work of Sri Bharati Krishna Tirthaji, a vedic scholar, who had rediscovered an ancient computational system and popularised it in the last century. His book Vedic Mathematics has since become a seminal reference for those working in the field. After spending a number of years developing my own skills in this area of mental computation, I began to realise that the techniques contained therein could radically alter the way in which mathematics was taught and resolve one of the problems I myself had detected some years earlier shortly before I left University College Cork. At the time I used to deliver a course designed for second civil engineering and applied science students. This course which went under the title of Numerical Methods, consisted of a little bit of mathematics, a little bit of physics, and a little bit of computer programming. The mathematics however was quite different to what the students were used to. It was more algorithmic than logical, it was more intuitive than rational, it depended more on developing a skill with numerical processes than following a strictly formulaic proof system based on theorems and lemmas. The students were often totally at sea if I used a particular expression with which they were unfamiliar. I found that there was great difficulty in reaching back in to a shared experience and guiding them to the particular way in which I was using a concept. Now, I say that there was a lack of general computational principles which could provide a unified treatment of the whole of mathematical/computational knowledge. It did take me a number of years before I retrained the way I perceived mathematical knowledge and began to see the potential encapsulated in the mental formulae of vedic mathematics. I too was a product of the same educational system as the students, but I had the advantage of having spent a number of years of thinking computationally, at least in terms of machine computation. At the time mental computation was not one of my strong points, and I used to wonder why, when I sought to perform often very simple mental calculations, I had to resort to a calculator. I knew I should be able to perform these calculations, but I did not have the training or skill. I felt a certain void in my own computational abilities and whereas I could think about and program computational processes at a very abstract level, when it came to the mental computation of simple numerical processes I was a victim of what I now call digital rust. A form of mental entropy caused by the fact that during my own education strict logical neural pathways had been reinforced at the expense of neural heuristics, neuristics, based on a more skilful approach to basic arithmetic. The real revelation in my case came when I began to realise that the sutras of vedic mathematics could be compared with design patterns as used in software design. In one sense the sutras, word formulae, encapsulate knowledge, processes and techniques with a wide range of applications, from very simple numerical processes up to advanced PhD level. In fact it was after familiarising myself with the Vedic methods that I resolved a conundrum which I had come across in my PhD. It concerned a computational process where I had folded linear time around in a circle, and was able to compute a stable solution to a process involving transient behaviour, which had proved impossible to do just using linear time. I later realised that this was an example of the Vedic principle by the completion and non completion. The principle by the completion and non-completion occurs in a wide variety of situations in mathematics/computation. It suggests bringing the concept under consideration up to some form of wholeness, where the computational burden is eased and then removing the component used to bring it up to wholeness, in order to complete the resolution to the process. The principle may be taught to children from a young age when they are learning basic arithmetic. As an example if we wish to add 37 and 64, it is easier to complete the 37 to 40 by adding 3, performing the addition to get 104, and then performing the non-completion by subtracting the 3 to get 101. Initially this may seem like a lot of extra work, but the mind quickly attunes itself to this way of processing and enjoys the challenge of seeking new ways through the computational landscape. This in itself is a significant point, as the resolution to a computational process is as much about the process used to go from initial statement, to final resolution, as it is about whatever the final outcome may be. In a sense we can call this the tau of computation. I have attached a short paper entitled Variational Methods in Computation, which discusses aspects of this approach to computation. A significant aspect in respect of the computational knowledge enfolded within the sutras of Vedic mathematics relates to how disparate areas of computation can be related. In this way the principles underlying advanced computational concepts can be illustrated using often times very simple notions from arithmetic. For instance in order to compute the area of a trapezium, we can again use the principle of by the completion and non-completion. Initially the trapezium is brought up to fullness by adding a triangle at the top, the areas of the two triangles are then computed and the smaller is taken from the larger. Normally within the educational system such simple connections between arithmetic and geometry are not elucidated, and further possible avenues of correlation are not explored. Similar processes are to be found in algebra relating to completing the squares in solving quadratic equations, evaluating integrals, and finding Laplace transforms. These connections are like neural pathways linking different areas of the mind/brain physiology, they encourage holistic thinking and when included within the standard curriculum will develop a heuristic as well as logical approach to computation, and flood the brain physiology with the pleasure of neuristics. One final point is that I began to investigate the potential for using the Irish language, my own mother tongue, as a language of computation and it was then that I really began to appreciate the power of neuristics. The reason for this is that the implicit connections between words and concepts in Irish is different to the connections implied by English. This opened up an even richer vein of discovery, one which initially was surprised at until I realised that the Irish language was the oldest vernacular language in Western Europe and contained within it thousands of years of continuous adaptation to changing circumstances. I also discovered that many of the principles of Vedic computation could also be found within Irish. Finally note that a dictionary definition of heuristic relates to,' enabling a person to discover or learn something for themselves.' This is often a prized process in scientific research where it may go by the name of serendipity, the happen chance finding of treasure. If students of all ages are encouraged to develop their own neuristics, what a happy bunch of computational experts we will all become. We explore the universe to discover more about ourselves. My Irish concept for a heuristic process is féin aimsiú which relates to the process of discovering for yourself more about your own inner and outer potential. Students need guidance rather than constraints. They need principles rather than rules written in terms of abstractions. Computation needs to be based in simplicity rather than complexity, after all the universe computes according to very simple principles, it computes using the principles of natural computation. What else, it knows no better.